This competition is a step up from our scaled competition, War of the West which was held here in January. It will suit athletes who are ready to progress from scaled movements, but are not quite ready for an RX competition. If you have competed in a scaled competition before and are looking for something a little bit more challenging, then this will be suitable for you. If you have previously competed as an intermediate athlete, but have not finished top 3, then this will also be suitable for you. 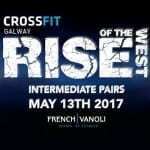 This competition is NOT for athletes who have already made the podium at an Intermediate level, or who have competed previously in RX. Masters athletes (40+) must both fit this age category. **PLEASE NOTE**: In the final, heavier weights and more advanced gymnastics movements may be used. Only the top 6 teams will make it to the finals.